Danielle Coots | Greene County News Beavercreek City Councilman Charles Carren is pictured with Benjamin Ward. Anna Yang presented her speech on the Voice of Democracy. Rebecca A. King presented for the Patriot Pen Award. BEAVERCREEK — Six Beavercreek students had a chance to speak about their American patriotism and to win money for their future education on Jan. 15. 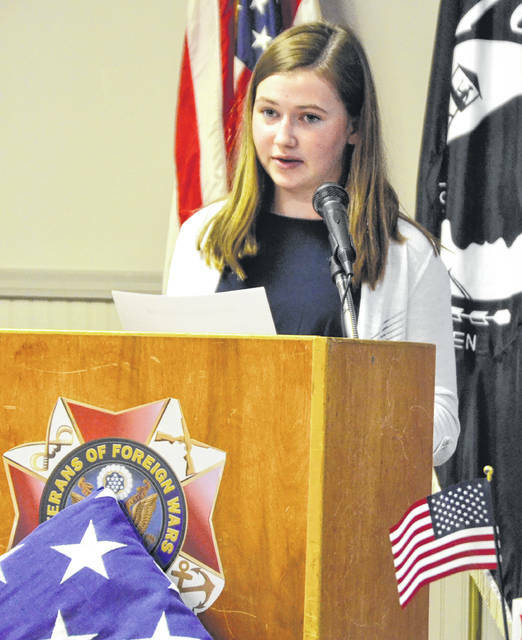 The Beavercreek VFW Post 8312 hosted an award ceremony and dinner celebrating these outstanding students and present the winners scholarships for the Voice of Democracy program that was established in 1947. “You will be very surprised by the talent exhibited by these students tonight,” VFW Post 8312 Chaplin Bob Moore said. Benjamin Ward stood before the judges and spoke of his generations worries, school safety, immigration, international affairs. The Voice of Democracy Program was designed to provide local students grades 9-12 the opportunity to express their thoughts regarding democratic ideas and principles. There are more than 51,000 students from around the country that apply each year for a chance to be the most patriotic for their region. Locally, the winner of the Voice of Democracy Award has a chance to win scholarships that range from $1,000-$16,000. Also, the first place winner from each VFW receives an all-expense-paid trip to Washington, D.C. Nationally, the first place winner receives a $30,000 scholarship paid directly to the winner’s choice of university, college or vocational school. Students are eligible to apply each year, regardless if they won previously. It’s a great way to help pay for college and continue education after high school. The winners include: 1st place: Benjamin Ward; 2nd place: Anna Yang and 3rd place: Kathleen Simons. Benjamin Ward will be now be eligible for the national award. 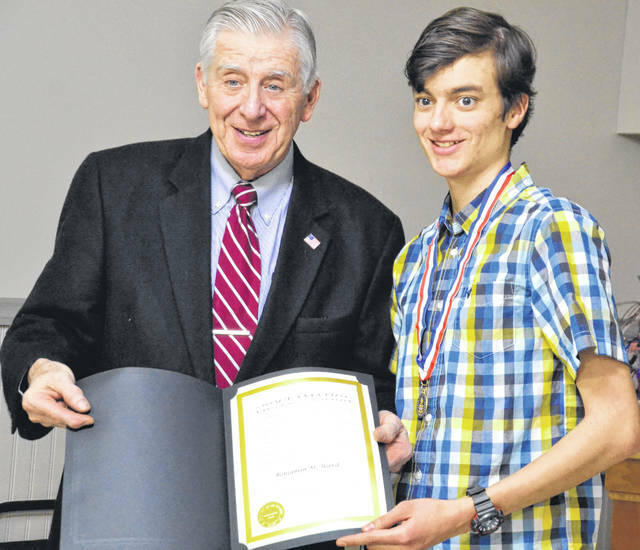 The Patriot Pen Award is a way to encourage youth to examine the nation’s history and utilize their own experiences in the modern American society to create a unique speech for a chance to win scholarship money for their future. The Patriot Pen Award is designed for students in grades 6-8. The winner is awarded savings bonds as well as an all-expense paid trip to Washington D.C. for the National first place winner. Patriot Pen contestants must write a 300-400 word essay expressing their views about patriotism. Each year’s theme is chosen by the VFW Commander-in Chief. Patriot Pen award winners were: 1st place: Rachel Ward, 2nd place: Rebecca A. King and 3rd place: Gabrielle Hager. Also in attendance were parents, Beavercreek school teachers, representatives from the school board and to members of the the Beavercreek City Council Melissa Litteral and Charles Curran who presented the winners with proclamations of their success. https://www.beavercreeknewscurrent.com/wp-content/uploads/sites/49/2019/02/web1_Ward.jpgDanielle Coots | Greene County News Beavercreek City Councilman Charles Carren is pictured with Benjamin Ward. 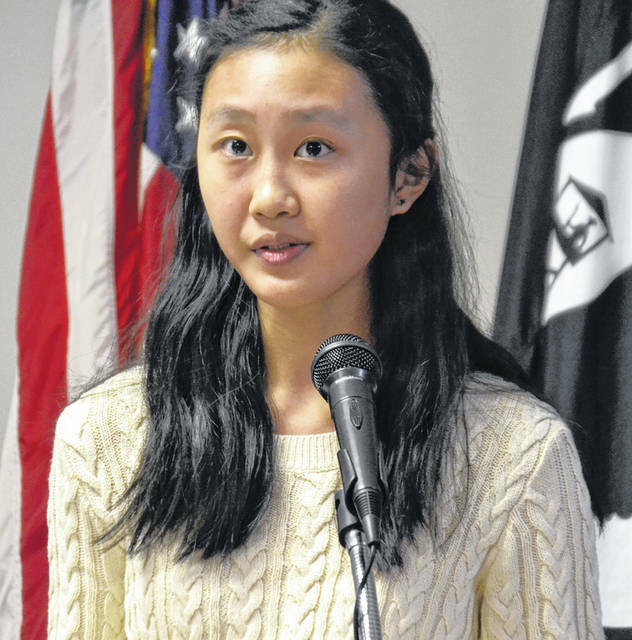 https://www.beavercreeknewscurrent.com/wp-content/uploads/sites/49/2019/02/web1_Yang.jpgAnna Yang presented her speech on the Voice of Democracy. https://www.beavercreeknewscurrent.com/wp-content/uploads/sites/49/2019/02/web1_King.jpgRebecca A. King presented for the Patriot Pen Award.